USS Perch SS176, the lead ship of Perch-class submarines of the United States Navy, is the first Navy ship to be named for the perch. At the outbreak of hostilities, Perch – commanded by David A. Hurt – was in Cavite Navy Yard. 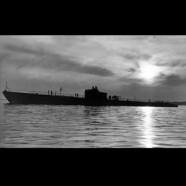 She took part in the rush to clear the Navy Yard on 10 December and watched, at close range, the destruction of Cavite by bombers. That night, Perch slipped through the Corregidor minefields and scouted between Luzon and Formosa (Taiwan) in search of targets. Failing to detect any, she shifted to an area off Hong Kong, and on Christmas night, launched four torpedoes at a large merchantman, all missing. A few days later, she torpedoed a merchantman. Enemy escorts prevented Perch from observing the kill. Perch sailed south to Darwin, Australia, to repair damage, making several unsuccessful attacks en route. She next made a patrol to Kendari, Celebes (Sulawesi), where she scouted the harbor and made several attempts to get through the narrow entrance to an attack position. After a week of close contact with the enemy, obtaining information, Perch headed south searching for targets. In a night attack on a large merchantman off the eastern coast of Celebes, Perch was hit in the superstructure, forward of the pressure hull of the conning tower, by a high explosive round which blew away the bridge deck, punctured the antenna trunk and temporarily put her radio out of commission. Her crew, by very courageous effort, made repairs on deck at night in waters heavily patrolled by the enemy, and Perch headed for the Java Sea. On the evening of 1 March 1942, Perch surfaced 30 miles (48 km) northwest of Surabaya, Java, and started in for an attack on an enemy convoy landing troops to the west of Surabaya. Two enemy destroyers (Amatsukaze and Hatsukaze) attacked and drove her down with a string of depth charges which caused her to bottom at 135 feet (41 m). Several more depth charge attacks caused extensive damage, putting the starboard motors out of commission and causing extensive flooding throughout the boat. After repairs, Perch surfaced at two o’clock in the morning, only to be again driven down by destroyers. The loss of oil, and air from damaged ballast tanks, convinced the enemy that Perch was breaking up and they went on to look for other kills, allowing her to escape. With decks awash and only one engine in commission, the crew made all possible repairs. During the early morning of 3 March, a test dive was made with almost fatal results. Expert handling and good luck enabled her to surface, and she began making repairs. Then, as if this was not enough, two Japanese cruisers and three destroyers moved into view and began firing. As shells straddled the boat, her skipper ordered, “Abandon ship, scuttle the boat.” With all hull openings open, Perch made her last dive. She was stricken from the Naval Vessel Register 24 June 1942. The entire crew was captured by a Japanese destroyer. Of the fifty-four men and five officers, all but six — who died of malnutrition in Japanese prisoner-of-war camps — were able to return to the United States after V-J Day. On 23 November 2006, Thanksgiving Day, the wreck of Perch was located by accident by an international team of divers off the coast of Java. The expedition had hoped to photograph the wreck of Exeter, sunk in the same area on 1 March 1942.